Crown (Cap)-is an artificial cover over a tooth. A crown is often indicated on teeth that have had root canal treatment, fracture or crack, large chip, or had a large filling. Crowns can also be used to change the shape of a tooth, fix a cosmetic problem or to correct a bite. Porcelain Fused to Metal (PFM)– this crown has a metal base with porcelain baked over the metal to give it that tooth colored appearance. 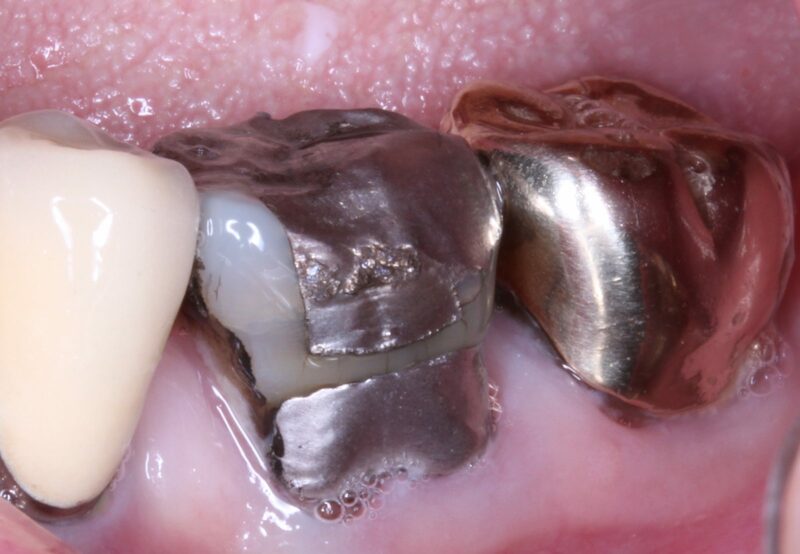 One of the disadvantages to this crown is sometimes a bluish or black tint will appear on the gums if the gums are thin, showing the color or shadow of the metal. 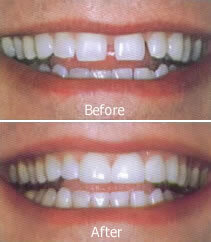 However, it is one of the strongest types of esthetic crowns and is usually a little more economical. Lower Left Molar before PFM Crown. Flanked by an older PFM in the front and a FGC at the back. 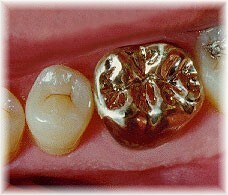 Full Gold Crown (FGC)– this is an all metal crown. 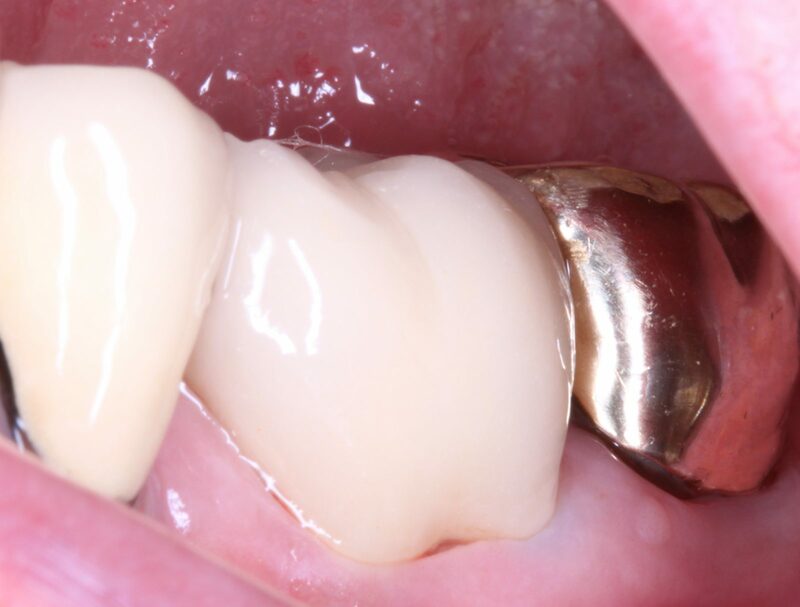 This type of crown is very kind to your gums, strong, and has no porcelain to chip off. If you need to crown a molar tooth or if you are a bruxer (grind or clench your teeth), your dentist will probably recommend this type of crown for you. 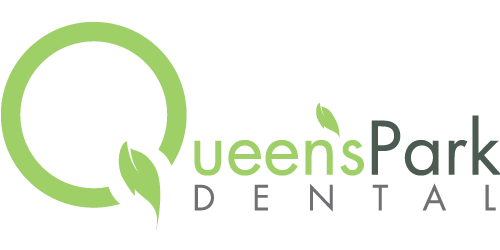 This crown has similar properties to your natural teeth and is a great option. This crown is gold in colour. All Porcelain Crown– their is no metal core to this crown, it is ALL porcelain. 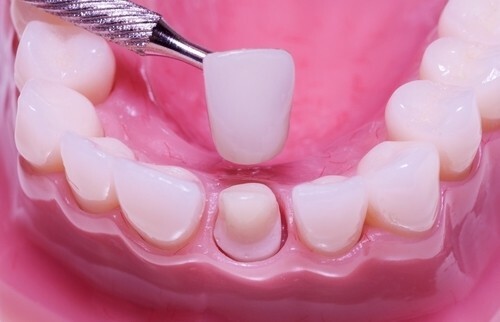 It is the most esthetic crown and nowadays are similar to strength as a porcelain fused to metal (PFM) crown. The porcelain is translucent (allows light to pass through it) and gives it more of a natural look. Due to the higher cost in fabricating this type of crown, it may cost a bit more than the other crown types. For more information on Dental Crowns, check out our Blog.